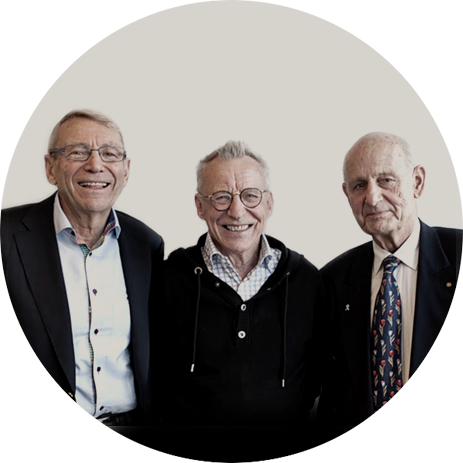 The three initial ForeSight founders, Sven Atterhed, Lennart Boksjö and Gustaf Delin had line management backgrounds in large companies. They first worked together as consultants at Innotech, a leading US consulting firm, in the development of business concepts. It soon became clear to the Swedish trio that creative business concepts/ideas were only one ingredient in the success of new ventures. From venture capitalists in the USA the group learned early that the entrepreneur and the entrepreneurial team account for some 75% of the success of a new venture. A new concept ”Intrapreneurship” was born. Looking at the way venture capitalists engage on the open market to support entrepreneurs prompted The ForeSight Group in 1979 to develop programs to support internal entrepreneurs, within large organizations. A new concept was born to help speed up the process of innovation and change in large companies, drawing on the energy and drive of internal entrepreneurs – intrapreneurs. The idea was to create a win-win situation for companies and for intrapreneurs. The companies would keep their internal entrepreneurial talent for creating new businesses and the intrapreneurs would be able to build on the established brand names and networks of the large company and share in the success at limited risk. The ForeSight methodology helps companies to speed up the process of bringing new ventures, products and services to market and of implementing internal projects. The ForeSight Group later built on this experience to develop programs to help top managements in identifying strategic issues and in applying entrepreneurial principles to implement strategy. This process, which was later described by Professor Henry Mintzberg as emergent strategy is now well recognized as a theory, but few seem to know how to apply it in practice. In 1983 ForeSight set up a company in Washington D.C. to test its methods in the world’s most demanding market. For this purpose, only large US owned companies were approached. From the USA ForeSight returned to Europe via the Economist Conference Unit in London and Management Center Europe in Brussels, where ForeSight held seminars based on the ForeSight methodology of intrapreneurship. This led to a number of assignments with major European companies. During the 1990s ForeSight worked with top-management teams on emergent strategy, in parallel with front-line innovation driven by intrapreneurs. This involvement became a powerful means of influencing corporate cultures towards becoming more entrepreneurial. Björn together with Dr Anders Aspling and Strike Team members used The ForeSight Approach to from the very start set the framework for and to develop The Globally Responsible Leadership Initiative. Founded with the European Foundation for Management Development and UN Global Compact, this long-term initiative to renew business schools worldwide, has engaged some 75 institutions and major corporations, including INSEAD, London Business School, Instituto de Impresa, Aviva, IBM, etc. Björn supported The World’s Children’s Prize (WCP) actively since its start – both as a board member and its International Ambassador. Several of the ForeSight Strike Team members also served as board members of what has become the world´s largest empowerment initiative on human rights and democracy for the next generation. Close to 50 million students in over 100 countries have joined as Global Friends schools in support of WCP. An estimated 100,000 teachers and 800 hundred organizations and departments of education contribute their time to its implementation. Nobel laureates Nelson Mandela (posthumous), Desmond Tutu, José Ramos-Horta and Joseph Stiglitz are patrons. WCP was recognized as ”the most important communications initiative on the planet” at the 2008 AGM of the 16,000 member-strong International Association of Business Communicators. In 2011 The ForeSight Strike team partnered with Swedbank, the oldest bank in Scandinavia, to launch a new initiative, Passionate Investments. It offered the banks clients investments and traditional philanthropic opportunities targeted at achieving social and environmental impact. The Bank and the ForeSight Group first planned to guide private banking clients and later potentially its broader client base to pursue Passionate Investments. Realizing ample opportunities already exist in the social and environmental sectors, ForeSight partnered with organizations, such as the Clinton Global Initiative and its members to source for-profit and not-for-profit deal flow. matching of clients to socially-and environmentally oriented investment opportunities. The initiative was recognized for its innovation by President Clinton at the plenary closing of the Clinton Global Initiative AGM 2011and is now being further developed and expanded. In 2014 Mark Drewell (see bio under Strike Team section) joined the ForeSight Group as senior partner and the group decided to work only on issues relevant to our times. Lennart Boksjö and Gustaf Delin. CEO of The ForeSight Group. Senior Partner of The ForeSight Group.